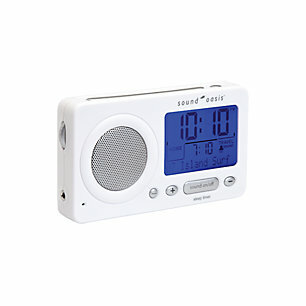 Sound Oasis Travel is a unique sound therapy product that combines high performance digital sounds with a full-featured travel/alarm clock. 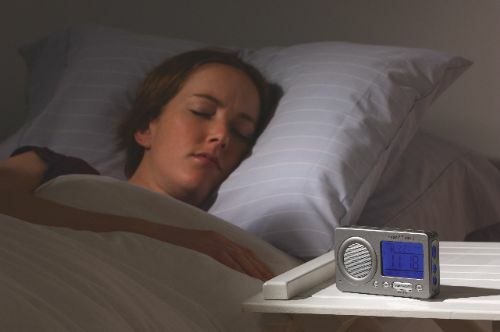 Incorporating 18 digitally recorded sounds, an exclusive jet-lag reduction sound and a voice memo feature, Sound Oasis Travel allows users to drift off to sleep with soothing nature sounds and wake up to one of four alarm sound types (sound, jet lag reduction sound, voice memo or buzzer). Powered by 4 "AA" batteries or the included worldwide AC adapter, Sound Oasis Travel is ideal for use while traveling or at home. Its compact size allows the unit to comfortably slip into briefcases, carry-on luggage and even one's jacket pocket. Product dimensions: 5.43" x 1.3" x 2.99"
Package dimensions: 9.65" x 1.97" x 5.2"